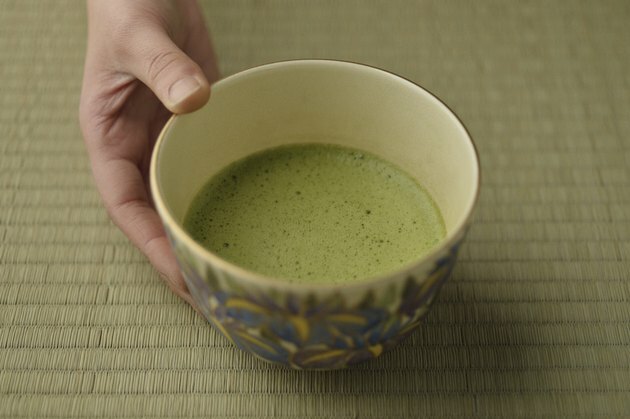 Does Green Tea Lose Antioxidants When Cold? About 85 percent of all the tea that Americans drink is iced, according to a 2014 report by the Tea Association of the U.S.A. Of the four types of tea – black, green, oolong and white – green displays a definite advantage in antioxidant content. You don’t need to drink your tea hot to reap the health benefits of the antioxidants, but when it's iced tea, it’s best to brew your own; bottled tea contains smaller amounts of these health-promoting compounds. All teas come from the same plant, a shrub called Camellia sinensis. However, differences in the way the plant’s leaves are harvested and processed result in distinct tea flavors and appearance. White tea comes from the youngest leaves, which are simply picked and dried, while green tea leaves are steamed before drying. Both white and green teas are light in color and have a mild, sweet taste, and both undergo minimal processing. In contrast, oolong and black tea leaves go through more processing, including fermentation, which gives them a stronger flavor and deeper color; they also contain more caffeine than either white or green tea. Green tea comes in hundreds of varieties, with the best-known coming from China and Japan. You can buy green tea loose or in teabags, and some manufacturers bottle green tea. Although more people drink black tea than any other variety, green tea has grown in popularity, probably because its antioxidant content is reputedly greater than that of other teas. Antioxidants are compounds that curb the activity of free radicals – wayward molecules that can damage your DNA and cause disease. The specific antioxidants contained in green tea are catechins, of which one of the most plentiful is epigallocatechin-3-gallate or EGCG. The numerous benefits associated with the EGCG in green tea include lowering cholesterol and triglycerides, which are risk factors for heart disease; protecting against many types of cancer; helping to control blood sugar levels, a boon for diabetics; and boosting metabolism to assist with weight loss. According to Selena Ahmed, a research fellow at Tufts University, storage method and length as well as method of brewing directly impact the antioxidant content of green tea. The EGCG in green tea leaves decreases 28 percent over six months of storage in the home; other catechins in the tea decrease by as much as 51 percent over the same period. It’s best, then, to brew and drink green tea soon after buying it to reap the greatest antioxidant benefits. And loose tea is superior to teabags, states Ahmed; the bags often contain an inferior grade of leaves that has been exposed to more light, decreasing the levels of catechins. That doesn’t mean you need to drink green tea hot, however. Steeping tea leaves in cold water does not make them lose antioxidants, according to a study published in the journal Food Chemistry in 2010, so cold brewing is one efficient way to prepare iced tea for maximum health benefits. In the study, cold-brewed tea steeped at room temperature for 2 hours, in contrast to hot tea, which was brewed for just 7 minutes, and their antioxidant levels were comparable. Bottled tea is 15 times more popular than it was a decade ago, says the Tea Association of the U.S.A. Several manufacturers have jumped onto the green tea bandwagon, producing bottled green teas with added flavors and sweeteners. One study, published in the Journal of Agricultural and Food Chemistry in 2001, found that some ingredients used in the production of bottled green tea – as well as the storage and transportation times involved in manufacturing it – degraded the catechin content. A 2010 report presented to the American Chemical Society reached similar conclusions; the scientists estimated you would have to drink 20 bottles of some types of green tea to match the antioxidants in a single home-brewed cup. In addition, most bottled teas contain added sugar, which further negates the health benefits of the beverage. Even one healthy organic variety of bottled green tea has 19 grams of sugar in a serving. That’s half of the maximum sugar intake the American Heart Association suggests for men in a day and 76 percent of what is advised for women. To preserve the health benefits of your green tea, then, consider brewing it yourself. You’ll not only preserve more of the antioxidants, but you can also control the added sweeteners. How Much Green Tea Should You Drink to Lose Weight? Can Decaffeinated Green Tea Make You Lose Weight?